With the weather slowly improving we’ve started going non-traditional for Sunday lunch – that and the fact that the Dedham Vale roast sirloin of beef can’t be beaten at the Rose and Crown in Great Horkesley, which is a short stagger across a muddy field from our house and an even bigger stagger back! There were a couple of things I wanted to incorporate into lunch – salted nut praline into a dessert and Morcilla Iberica. I’ve been obsessed for the last 18 months with finding a recipe for the salt caramel nut brittle that is sold in Ottolenghi – i’ve found one that I think is close, hence buying a couple of kilo’s of dark chocolate a few weeks ago, however I’m still recovering from the chocolate hit I got in my Death by Chocolate post. 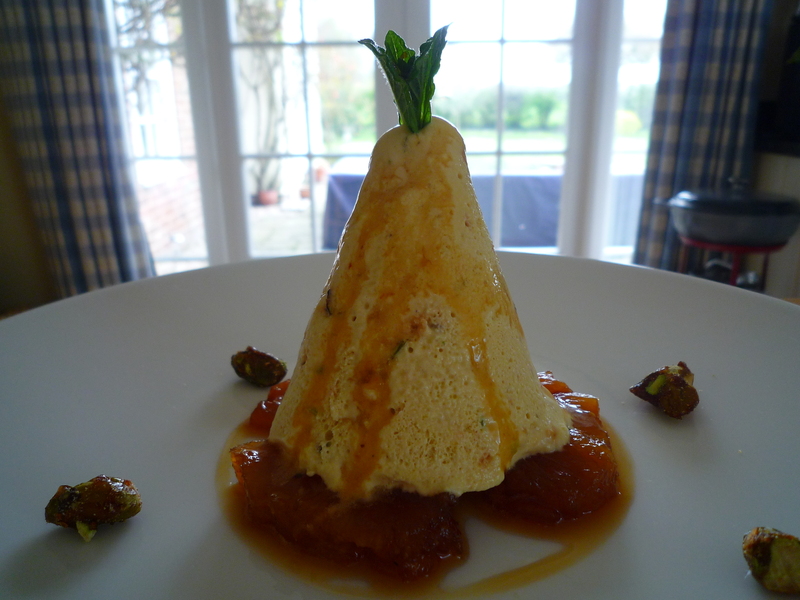 I decided on a Semi Freddo as it is quite light and I incorporated some smashed up salted pistachio praline. The Morcilla Iberica which I recently bought from the Delilah Deli in Nottingham as I can’t find it elsewhere – come on Brindisa get your act together, would go into a favourite dish of ours; Barrafina’s Morcilla Iberica, piquillo pepper and quail eggs, and as I just so happened to have some quail eggs left, job done. For the main I decided on a variation on a chicken dish from Gizzi Erskine’s new book Skinny Weeks and Weekend Feasts served with parmesan and truffle gnocchi. Unfortunately my appetite led me astray and I was half way through the starter before I realised I hadn’t taken a photo, so apologies! Quail eggs are notoriously hard to crack without breaking the yolk so I use a small serrated knife to cut the bottom off of the fat end then put back into the box (obviously fat end upwards) until I’m ready to cook them. Preheat the oven to 220C/gas 7. To make the sage and truffle butter, put the butter and sage in a small pan and cook over a medium heat until the butter is golden brown and smelling nutty. Remove from the heat and stir in the truffle oil. Lift a narrow line of skin from each side of the chicken breasts to form two pockets. Push the sage butter under the chicken skin, season with salt and roast for 20 minutes. Lower the oven to 190C/gas 5 and cook for 35-40 minutes, or until the juices run clear. Cover with foil and leave to rest. Meanwhile, make the gnocchi. Scoop the flesh out of the baked potatoes and mash using a potato ricer into a large mixing bowl. Form a well in the centre of the mashed potato, add the flour, salt and cheese and stir together, then gradually mix in the truffle paste and beaten egg. Press the mixture together to form a dough, adding a little more flour if it seems too wet, and tip onto a floured surface. Shape into a long log, then cut into 2cm lengths. Using a fork, press down onto the top of each, then gently squeeze the sides so that the gnocchi resemble pillows. Bring a pan of salted water to the boil, add the gnocchi and cook for 1–2 minutes, or until the gnocchi have risen to the surface. Strain, add to the butter sauce and fry until the gnocchi are coated and catching in places. 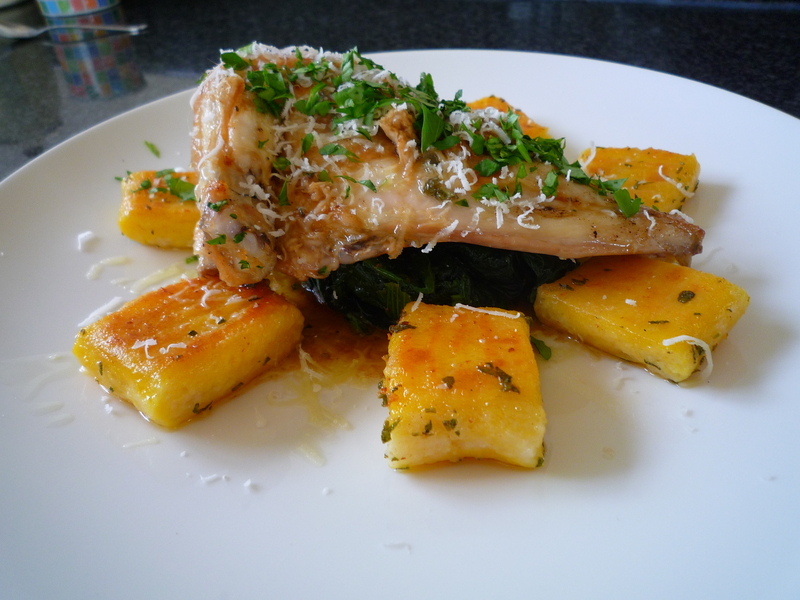 Carve the breasts from the chicken and arrange the gnocchi and spinach on plates. Pile the chicken on top and spoon over the chicken juices from the tin to finish. Take a large frying pan and spread the sugar evenly and pour in water for the pineapple and put onto a medium heat. Don’t stir. When the sugar has dissolved and starts to change colour add the pineapple pieces and chilli flakes. Stir and start to coat the pineapple and continue to heat until the caramel turns a golden dark colour. For the praline put the sugar in a small heavy-based pan and add a tablespoon of water and place over a low to medium heat until melted. Raise the heat and cook until it forms a dark golden caramel. Add the nuts and salt and remove from the heat. Pour the mixture on to a parchment lined baking sheet and leave to cool. When completely cold and hard, smash into small pieces using a rolling pin. Store in an airtight container until ready to use. For the semi freddo place the eggs, extra yolks, vanilla and sugar in a heatproof bowl over a saucepan of simmering water. Beat with an electric beater for 5-6 minutes or until thick and pale. Remove from the heat and beat for a further 5-6 minutes until cool. Place the cream in a separate bowl and beat until stiff peaks form. Gradually fold the egg mixture into the cream until just combined. Add 1 cup of the salted caramel and use a knife to swirl it through the egg mixture. Pour into a 2 litre-capacity metal tin, or individual containers (I used the paper cone cups you get from water dispensers) and place in the freezer for at least 6 hours or overnight. Drizzle with remaining salted caramel and serve with the pineapple. 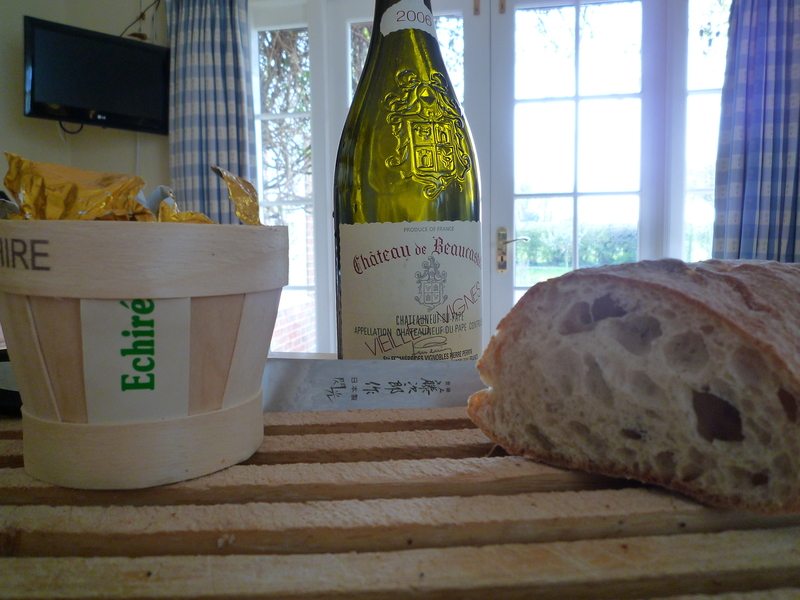 The 2006 Beaucastel Vieilles Vignes is 100% Roussanne and only 6,000 bottles are made. It is a voluptuous feminine wine that demands fine food. If you glug this tout seul then beware, the wine police are on standby! The winemaker states that this wine should be consumed at up to 3 years old and then after 15. This can only mean that PC Plod will be knocking on my door. This expressive, complex, wine is medium + lemon in appearance and has aromas of marmalade, lemon and yellow fruit. The palate is compelling with deep rich layers of ripe tropical fruits, honeysuckle, almond, hazelnut, subtle sweet spice and honey. Needless to say there is a waxiness underpinning those luscious elements which is as one would expect from this grape. The finish is long, full bodied and very well integrated. This is an amazing wine and Bobbins Parker gave it 98 points…..go figure. Categories: Food | Tags: Barrafina, Blanc Vielles Vignes, Brindisa, Chateau de Beucastel, Chateauneuf-du-Pape, Dedham Vale, Delilah Deli, Gizzi Erskine, Great Horkesley, Morcilla Iberica, Nottingham, Ottolenghi, piquillo pepper, piquin chilli, Quail egss, Robert Parker, Rose and Crown Great Horkesley, Roussanne, salt caramel nut brittle, Sunday lunch, Sunday roast, white truffle oil | Permalink. Both blogs today are very good.